Ride-share companies have become increasingly popular with many people due to the low fares and convenience. In St. Louis, Missouri, like other states, Uber and Lyft give passengers the flexibility of being able to call for a ride on short notice and not have to worry about parking or driving if they want to enjoy a few drinks at a social gathering. Like other motor vehicles operating on the roads and highways, ride-share services are not immune to collisions and crashes. Since Uber drivers use their own personal vehicles to transport passengers, they must maintain the appropriate liability insurance per the state mandates. When a pedestrian is in an Uber accident, they may not always receive the compensation they are due because Uber has very intricate insurance policy coverage. An Uber driver is an independent contractor, and in the event of an accident when not transporting passengers, they must use their own car insurance to compensate for property damages and personal injuries. However, if a ride-share driver is on-duty, but in-between fares, the driver will have coverage through Uber’s contingent liability insurance coverage in addition to their personal auto insurance policy. This means that a pedestrian suffering Uber accident injury after an Uber accident will be able to collect from Uber’s insurance coverage if the driver is on-duty at the time of the collision. The compensation for injuries cannot exceed the company’s maximum coverage limit. If your injuries are more than Uber’s limit, you will have to file a claim to receive additional compensation through the driver’s personal auto insurance policy. In addition to being responsible for your Uber accident injury damages, the Uber driver will face charges if they leave the accident scene. It is a crime, and the ride-share driver could face fines and time in jail and risk losing driving privileges. Since you have injuries from the accident, the driver would have felony hit and run charges. The only time a driver can leave an accident scene is to temporarily go to obtain emergency assistance. What Damages Can I Collect for Uber Accidents in St. Louis, Missouri? If you have an Uber accident injury attorney, if you decide to accept a settlement, they will make sure all necessary charges are included in your claim, especially if you will require more medical care in the A lawyer will work with your doctors to obtain estimates of the costs for any future treatments that are necessary for your recovery. After your Uber accident, you may also be able to file a claim for loss of income if your personal injuries make it impossible for you to earn income. An Uber accident injury attorney can request compensation for lost wages because you will be unable to work while you go through physical therapy, have an extended stay in the hospital, and any other issues relating to your injuries that will prevent you from working and earning money. You will have to prove that your injuries will prevent you from earning money at the same level you did prior to the accident due to your personal injuries. If you do not receive a settlement and your case goes to trial, the judge or jury will have to consider how old you are, the kind of work you perform and the training you have, how much experience you have in your field and estimate your lifespan. When you are in a vehicle collision, you will experience pain, bumps, scrapes, and cuts which a doctor can easily see during your examination. You may also have internal injuries that are not visible to the naked eye, and you may have to return to the doctor. Occasionally, some injuries do not make an appearance until several days later. When you have a consultation with an Uber accident injury attorney, they will be able to explain to you how you will be able to receive treatment for physical injuries that develop later. In many cases, you will need to be able to seek medical treatment at a later date when you discover you have additional injuries relating to your Uber accident. In St. Louis, Missouri, there is no set limit on the amount of damages you can collect for your injuries from the responsible party. Your case will be subject to a time limit for the amount of time you have to request damages for your injuries and property damage. The state gives you five years to decide whether or not to seek legal action for your injuries and damages. An Uber accident injury lawyer in Missouri can explain to you how the time limit works and can make sure you do not miss the deadline. Once the five-year time period passes, you lose the option to seek financial compensation. It is a good idea to seek legal advice prior to making any type of decision on whether or not you want to file a claim. In the event, the Uber driver is unable to pay the full amount the court awards you, the state has a fund that may allow you to receive some of the money due to you for your claim. Can A Missouri Uber Accident Injury Attorney Help Me? If you or someone you love suffers injuries from an Uber accident, an Uber accident injury attorney can work on your behalf to make sure you receive the compensation you need. There can be thousands of dollars’ worth medical bills for your injuries, and you will be out of work, and a lawyer can help you get your medical expenses paid and get reimbursed for your time away from work. An attorney can investigate the accident by reviewing police reports, medical reports, and any other documentation you have relating to your Uber accident. They have the experience of negotiating a settlement with the ride-share driver’s insurance company to make sure any future medical issues you have will get medical care and attention. When you hire an Uber accident injury attorney, you can rest comfortably knowing that you have someone working for you to protect your rights. They will be able to use their resources to investigate all aspects of your case and put you and your needs first. The insurance adjuster wants to pay you as little as possible because that reduces the amount the insurance company is required to pay for your damages and injuries. They will look out for the best interest of their client, the ride-share driver, and the company’s assets. Do not attempt to negotiate with them on your own; you need someone with legal knowledge that knows and understands what you are eligible to receive. An Uber accident injury attorney is your best ally and defense against the insurance company. Insurance companies are not on your side. The main concern for most insurance companies is to make a profit and do not want to give you a fair settlement because it cuts into the bottom line. Every adjuster on staff tries to pay minimal settlement amounts and deny claims. An Uber accident injury lawyer knows how to present your medical evidence to insurance companies, judges, and juries in the best manner possible. They will be able to estimate the costs of future medical procedures you may require to heal from your accident. Uber accident injury cases can be confusing and difficult to prove. Let an experienced Uber accident attorney take the guesswork out of your case and answer any and all questions you have regarding your damages and injuries. If you or someone you love suffers injuries in an Uber accident, call our office to schedule an appointment for a case review and consultation. Our attorneys will work hard to make sure you receive all the compensation you deserve to recover from your injuries. A car accident can create unnecessary stress in your life. We care about your well-being and want you to focus on your health. Let us put our resources to work for you to investigate your accident and negotiate an appropriate settlement amount. 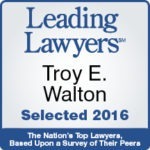 Call Walton Telken Injury Attorneys today so we can discuss how we can help you get the compensation you deserve. Our number is (844) 307-7349.